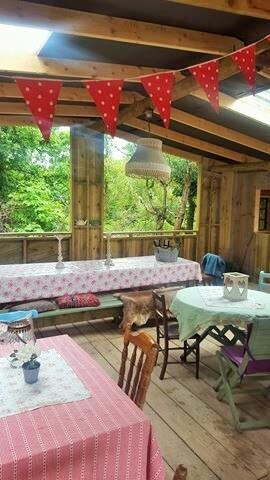 I celebrated my hen weekend just over a week ago at Teapot Lane Glamping in North Leitrim. It was without doubt one of the most fun, hilarious and loving weekends I have ever experienced with my friends and family. 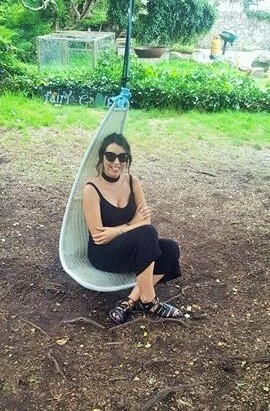 Last year when I chose glamping for my hen weekend, it was a fairly quick decision as I’d been eager to experience it long before my engagement and seen as my engagement was a suprise and we quickly set the wedding date, glamping seemed like the perfect thing to do for my hen. My friends all thought it was a great idea too but none of us knew just how great it was actually going to be! On the day itself, when the girls pulled up at my parents house on the mini bus that was going to safely take us to our destination, I could hear them before I saw any of them. Fourteen excited women hurried off the bus to greet me and from that moment I was made to feel so special. My sister Lorraine who is also my chief bridesmaid adorned me with a gold inflatable crown that I wasn’t too sure about at first to be honest, but it worked perfectly with my look and it was actually quite fun to wear. 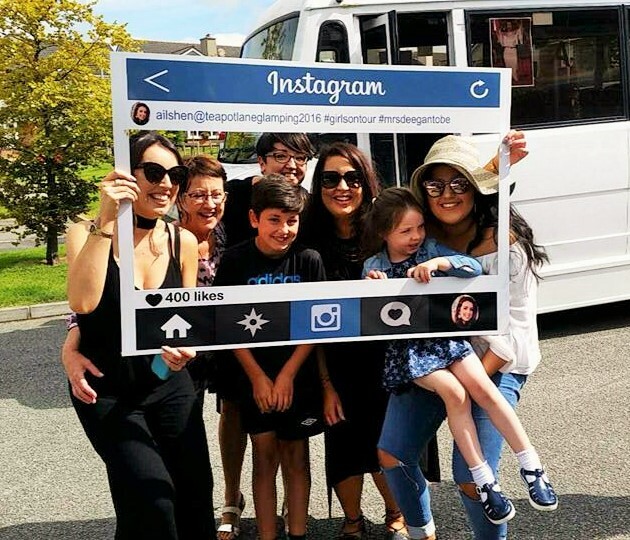 Once we took numerous group photos with my personalised Instagram sign (I’m a massive IG fan) and some teary goodbyes to my dear mother, fiancé and Olivia, I hopped onto the bus, composed myself and within seconds the girls made sure I was drinking Prosecco. 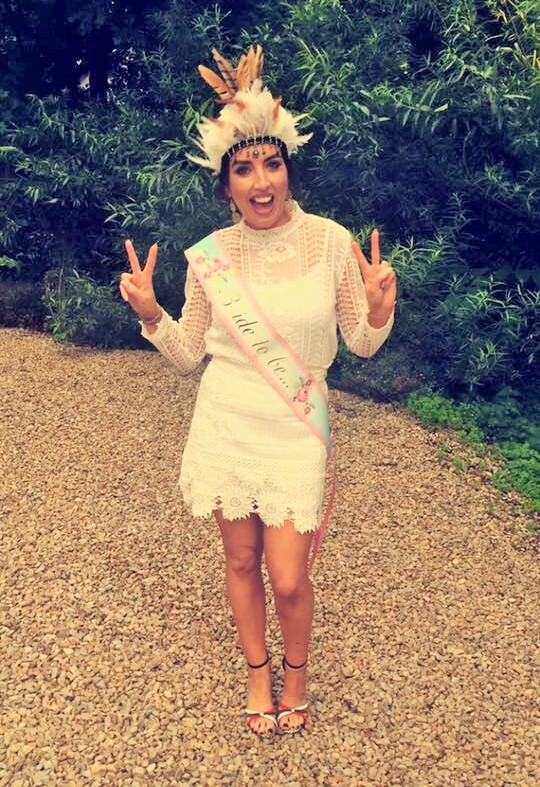 It was only 11.30am but it was my hen weekend afterall! 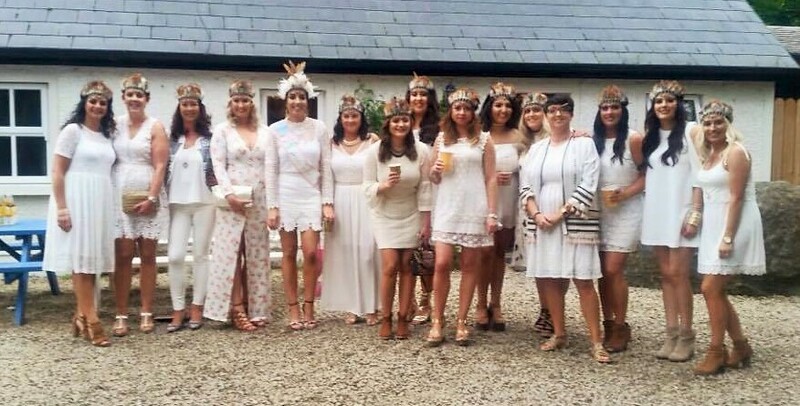 The music was playing, the banter was in full swing and it hit me at that moment that it was actually MY HEN PARTY. 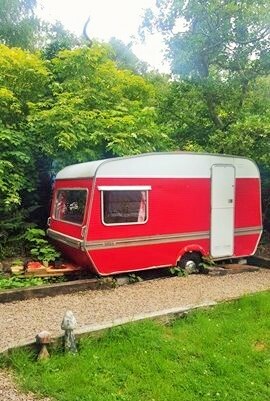 Lorraine had kept all the planning from me, all I knew was that we were going glamping and she took care of everything else. 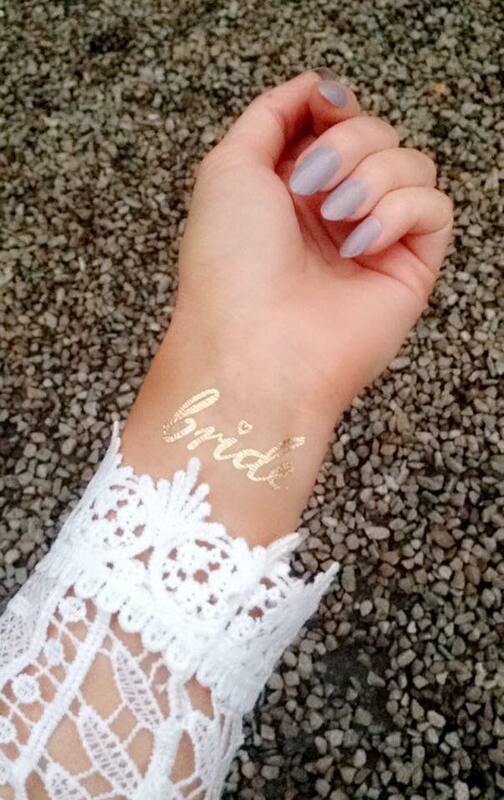 I wasn’t allowed to buy any hen party accessories which was literally killing me as I didn’t want anything tacky! But this wasn’t an episode of Don’t Tell The Bride and my fiancé didn’t plan my hen party, THANK GOD. My sisters, niece and cousin (aka the bridal party) knew exactly what I liked and they didn’t disappoint. There was sparkly goody bags for everyone onboard, so carefully filled with essentials for a girly weekend away. I was so surprised by those goody bags. Something else my fiancé especially liked was a heart cushion with pictures of himself printed on it, just so I wouldn’t miss him too much! My face was plastered on the windows of the bus, just letting passersby know that my hen party was in progress. Can you see why I was feeling so special? The journey was long, with numerous piss (not pit), food and smoking stops. We eventually arrived at Teapot Lane and we were excited to see our home for the next two day’s. From the get go, the atmosphere was tranquil and the communal outdoor area was clear to see. It looked pretty cool and straight away reminded me of my travels down the east coast of Australia, many moons ago. 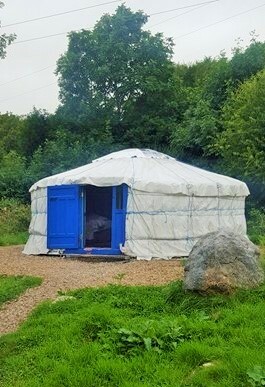 Our group accommodation was split into three, two groups stayed in Yurts and the biggest lot of our group stayed in Bluebell Cottage, including me. The camp fire was right beside us and we reckoned it was a good choice if we wanted to play music in the wee hours of the morning. 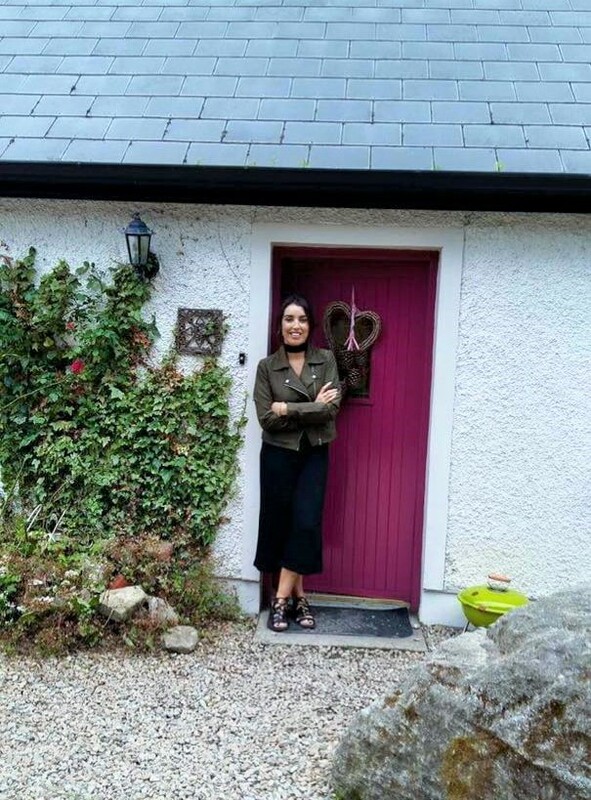 A lock in at Bluebell Cottage? I liked the sound of that! 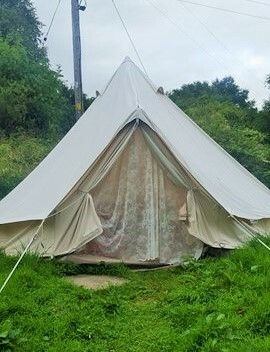 Once we unloaded our 17,000 bags off the bus (and my final two hens arrived by car) we settled in and started to get ready for our first evening of glamping. 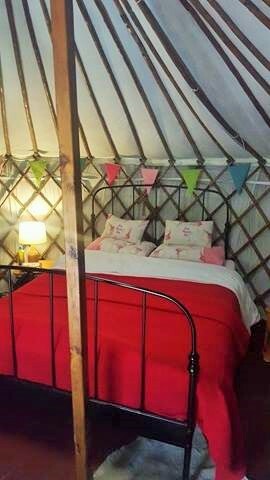 We all had a little wander around the grounds and explored all the different types of accommodation on offer – A caravan, tree house, yurts, and our cottage. A gorgeous variety of places to lay our heads for the night. 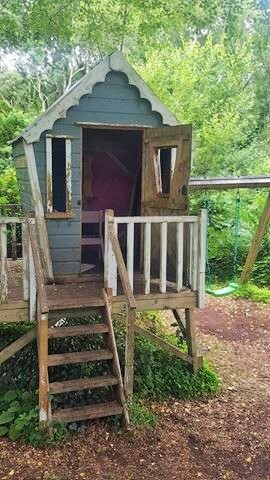 Then there was the little area for kids to play (as its family and pet friendly) a chicken coup, a fairy trail, hammock and hanging chair. Perfect little areas to unwind and chill during the day. Later that evening, as the camp fire was lit and the food was cooking -thanks to Shiv, Karen and Pam, we were chilling at the picnic tables. 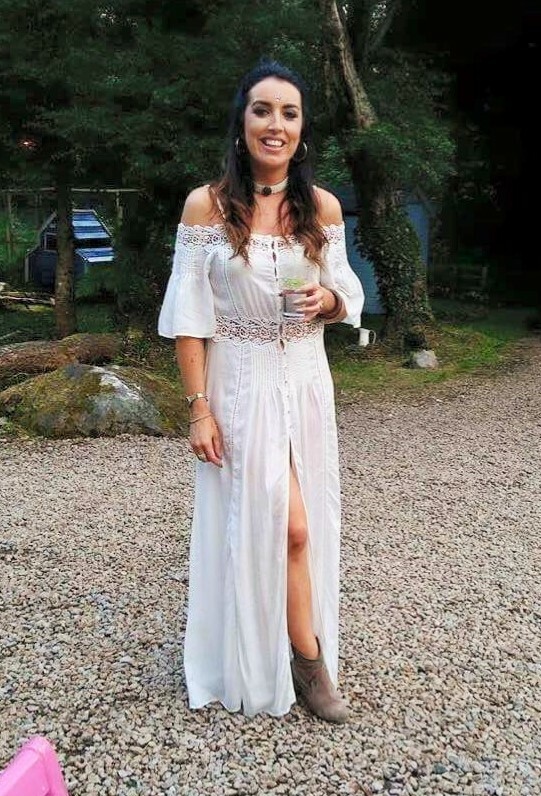 I got myself kitted out in my specially selected cream dress, it wouldn’t be a typical hen party if the bride didn’t wear white, well cream in my case! 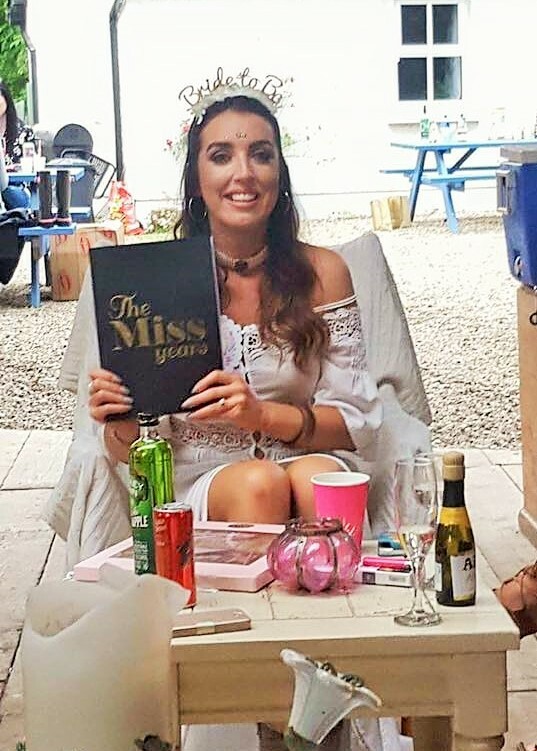 The girls ushered me over to the communal area and we sat down and they presented me with the most loveliest gift, “The Miss Years book” filled with photos and messages from my friends of stories of our lives growing up. I shed a tear or two (again) Then of course the questions began. I really wasn’t prepared for the “How well do you know each other?” quiz. My chief Lorraine had already asked Aaron questions and she had his answers written down and I had to try and match them. If I got any wrong I had to drink a shot. Lets just say I was gagging by the end of it! I didn’t get them all right, some of them were trick questions anyway! But it was super fun to play and the girls had a good laugh at my expense. 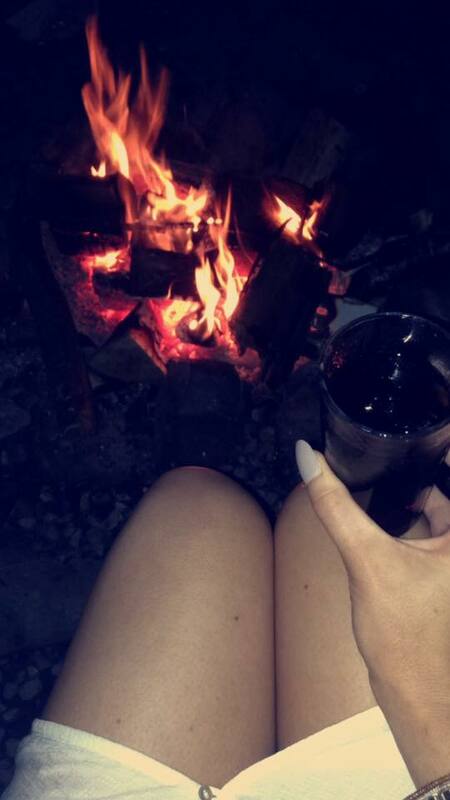 The night continued to get better and we all sat around the camp fire, singing, playing games and basically having a laugh, all the while drinking copious amounts of alcohol. It was so chilled, everyone was in great form and our location most definitely added to our mood. You could sense the good energy around the place and luckily the weather was just right for being outdoors too. Day two saw us with sore heads when we woke up, but spirits were high because it was a beautiful morning at Teapot Lane. Once the tidy up began and breakfast was cooking we all sat at the picnic tables and fed our hangovers. 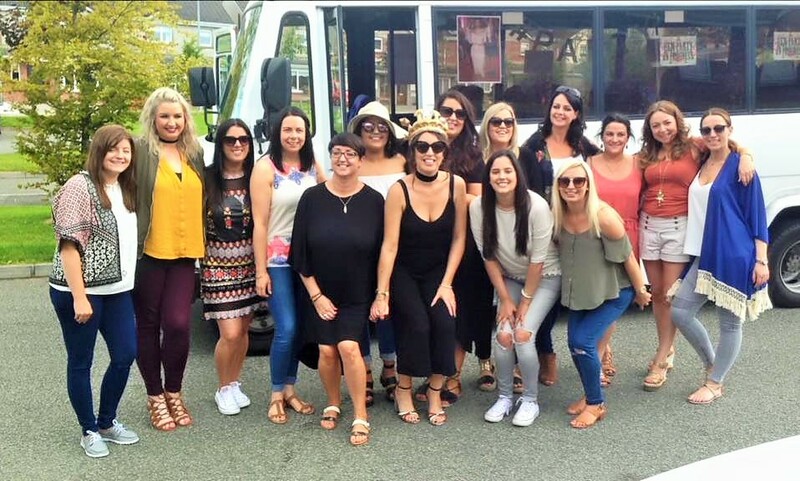 Our taxi arrived soon after to take nine of my group to horse riding through the sand dunes of Tullan Strand in Bundoran – Teapot Lane offer a number of different activities to choose from as part of the hen weekend package. The rest of my group chose to stay on site and have a massage later that day. The other choices on offer were Afternoon Tea, Surfing, Cocktail Lesson or a Photoshoot. We thought the horse riding was unbelievably fun though, a bunch of beginners getting on a horse with a hangover, anything could’ve happened but it was lovely to follow the trail through the sand dunes and take in the sea air. The perfect hangover cure, even though we had sore asses for a few day’s after! The rest of the girls were super happy with their massages too and were fully relaxed and panned out when we got back to the Teapot Lane. The suprises were still coming for me though and I got treated to a massage aswell when I got back from horse riding, another thing I hadn’t expected thanks to Lorraine! It finished the day off nicely for me before I had to start getting ready for my main hen night! 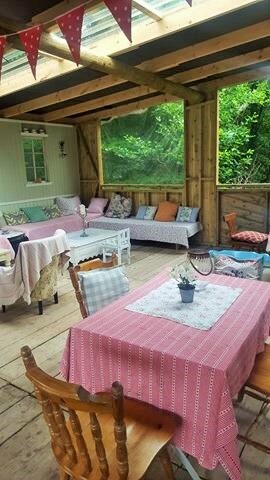 The glamping site was the ideal location for my theme. 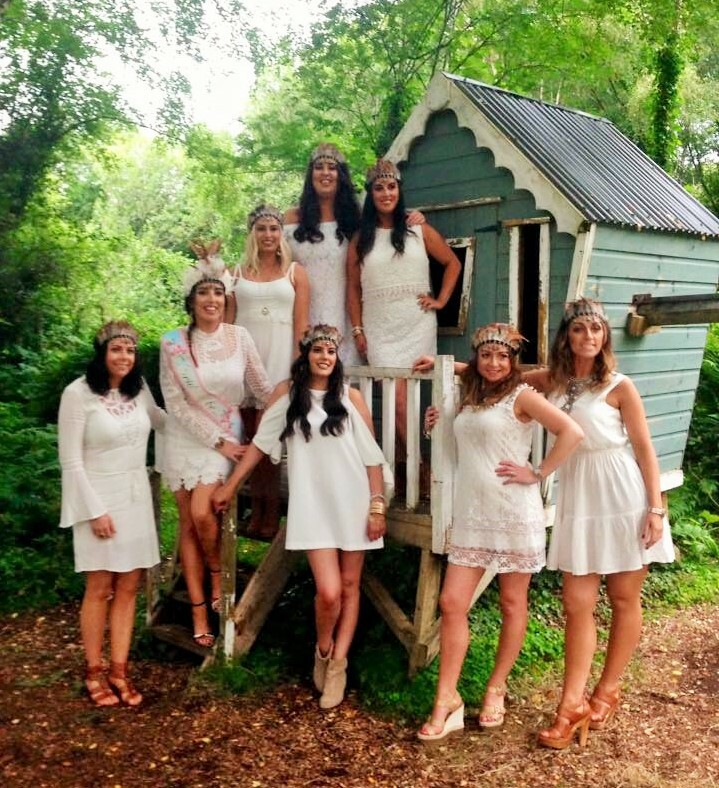 A boho festival inspired look, with all of us wearing white, complete with feather head pieces. I had it planned months in advance. 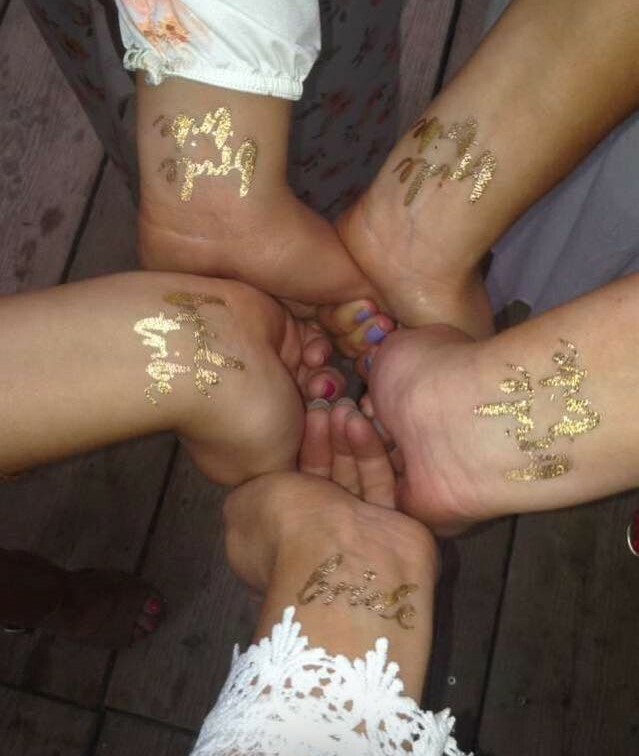 Another surprise from my bridal party were the fab Bride Tribe tattoos. They finished off our look perfectly. I adored how it all turned out and I wouldn’t change a thing. 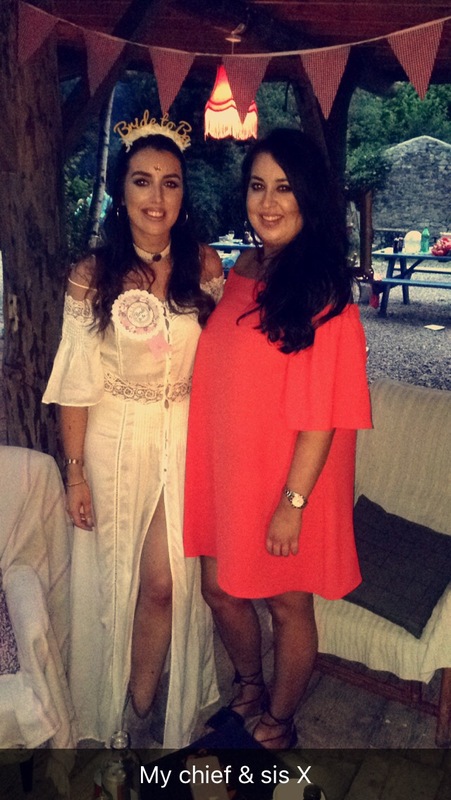 What I wore – Top – Folkster, Skirt – Topshop, Shoes – Penneys, Headpiece – Handmade by me. As the night got started, I realized there was a few more suprises in store for me in the form of a very tasteful bridal sash, veil and a gorgeous frame filled with polaroid photos of my life with Aaron and Olivia. Such a beautiful gift! Afterwards we walked across to the communal area and there we were treated to some seriously mouth watering food at the buffet. The package includes one night catering and the food did not disappoint. The menu consisted of minty marinated lamb, slow-cooked BBQ ribs, homemade beef & lamb burgers, cajun-spiced chicken skewers, freshly baked Atlantic salmon, homemade coleslaw, potato salad, bread and a veggie option of pasta bake too. Following dinner, a DJ played a private set in the communal area and it got us all in the mood to party. He played until 11pm and afterwards we got a taxi into Bundoran to go clubbing. 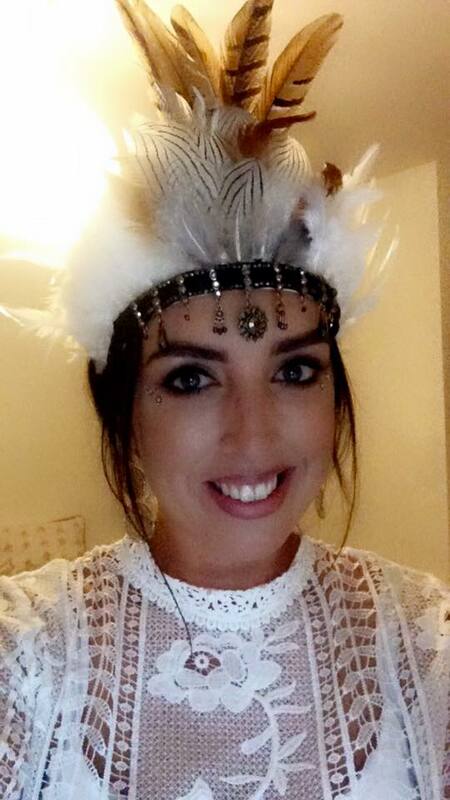 17 women in all white wearing feather headpieces attracted quite a bit of attention on the town and we had a fantastic night. The usual late night ensued and we got to have our lock in at Bluebell Cottage! We’re still looking at the videos! The following morning we had to prepare ourselves for a super long journey back to New Ross and we were sad to leave but we made so many good memories that I’ll personally never forget. You can see why this place is so cool right? 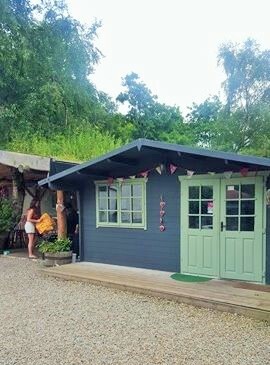 Everything about the place was positive, even though the owners live on the glamping site too, we never got the impression that we couldn’t be ourselves. They very much stayed in the background, only communicating if we approached them or vice versa. Lorraines point of contact was Derval and she found her extremely helpful and informative throughout the planning process. Teapot Lane will definitely be seeing some of us again in the future! This sounds like an amazing place. I love camping and glam-ping. It really connects you to what is important in life and great fun too. 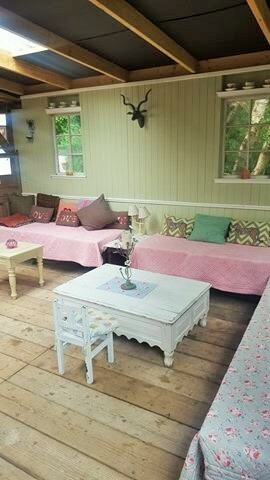 I live in a cottage farm house and am surrounded by such beauty so I’m glad you had a great hen night and got to experience such fun in such wonderful surroundings. I love the name of the place too..it has character. you and the girls look amazing! It must have been a great party! I wish i had a night like this.